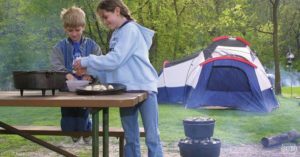 Iowa’s state parks are hosting “Camping Kickoff” events today to celebrate the unofficial opening of this year’s camping season. Todd Coffelt, chief of state parks for the Iowa Department of Natural Resources, says all of the state park campgrounds will host special programs. “The topics will vary from that individual (park) you’re staying in, the fish habitat our folks work on, or maybe some program related to hiking, birding, or kayaking,” Coffelt said. Campers who are staying in an Iowa state park today will also receive a free May/June issue of Iowa Outdoors magazine. Iowa’s state parks hosted more than 15 million visitors last year, according to the DNR, and that included more 900,000 overnight stays. Iowa has more than 4,700 state park campsites and more than half of them can be reserved in advance.